There’s always strength in numbers, which is why we’ve looked to partner with some of the world’s most renowned electrical and garden power tool brands. These include the likes of Hyundai and Ryobi, who produce an array of products including the best petrol, electric and cordless leaf blowers. At SGS, we’re proud to sell these Ryobi and Hyundai-branded products, because they match our own high standards in terms of quality, performance and design. Our range of cordless and petrol leaf blowers is second to none and can provide genuinely great value for money in both a domestic and commercial setting. So, whether you need to remove leaves, litter or debris from your garden, we’re sure to sell you a garden blower that meets your requirements. Whether you’re an amateur or a professional gardener, a leaf blower should be one of the most essential tools in your armoury. This is just one of the reasons why we’ve partnered with some of the top power tool brands in the world, as we aim to deliver a huge range of petrol and electric garden blowers to our customers. These cordless products are not only powerful and efficient, but they’re also easy-to-use and feature a lightweight design that allows you to work in your garden for extended periods of time. At the same time, they offer genuine flexibility to users, as they’re not restrained by a power cord and can be used in the deepest recesses of your garden space. Some of our cordless leaf blowers also offer versatile functionality, as they can be used as either a vacuum as a shredder. This is particularly good news for professional gardeners, who can effectively buy three tools for the price of one when shopping with SGS. Ryobi’s innovation One+ battery system also provides an interchangeable power supply for a range of cordless tools, creating even greater efficiency when working outdoors. Our branded leaf blowers combine to create an affordable, versatile and powerful range that can tackle several different outdoor jobs. Whether you simply want to remove some debris or clean away a mass pile of leaves during the autumn, we’re confident that we have the tool for you. Even if you’re stuck between two products or are new to gardening and simply unsure of where to start, you can contact our helpful team of technicians for some much-needed advice. They’ll help to guide you on your way and ensure that you get the right tool for your needs. Whether you’re green-fingered or not, you’ll need to invest some time and money into maintaining your garden. If you’re a professional, you may also need some expert guidance from time to time, which is why we’ve created a range of how-to and buying guides to help you get the most from your garden tools. This guide offers step-by-step advice on how to set up and use your chainsaw safely, even if you’ve never picked up a tool of this type before. Your strimmer is one of the most versatile gardening tools around, and in this guide we look at five of the jobs that it’s ideal for. Are you new to gardening? If so, why not check out this guide on the best and most versatile tools to help make the most of your garden space. Want to know how a leaf blower can help make ease of mundane tasks in your garden? 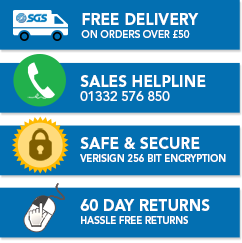 SGS Engineering let you know how with our online guide.